Sliced tail of the Sanctuary Guardian. 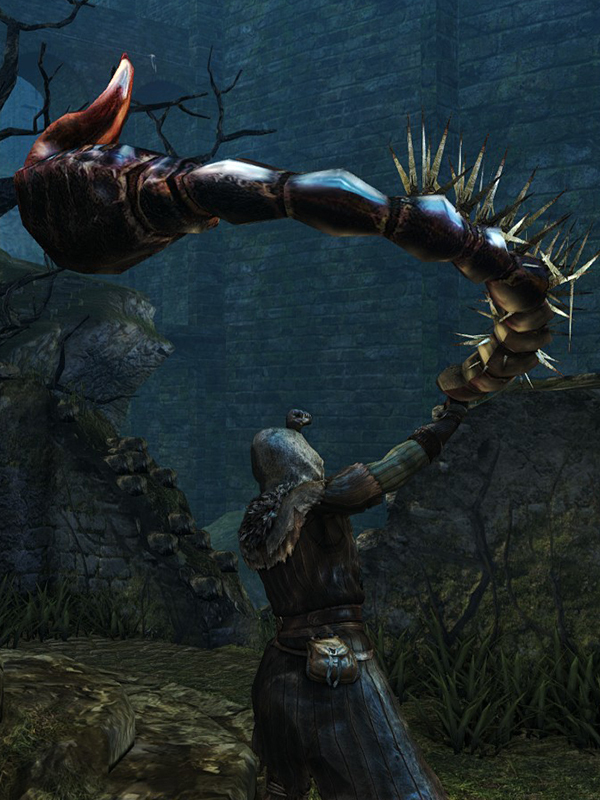 This flexible, spiked and highly poisonous tail would make a rather obnoxious weapon. They cannot be used for critical attacks (backstab, riposte, or plunging attacks). Move set is identical to Whip's. Base damage increased. Durability decreased to 25. Cannot repair. Lightning damage added. All stat bonuses removed. Base damage increased. Dexterity bonus reduced. Base damage reduced. Dexterity bonus reduced to minimal. Magic damage added with moderate intelligence bonus. Base damage reduced from magic upgrade path. Further reduced bonus damage from dexterity. Increased damage bonus from intelligence. Base damage reduced. Dexterity bonus reduced. Magic damage added with moderate faith bonus. Holy damage added. Base damage reduced from divine upgrade path. Increased damage bonus from faith. Holy damage changed to Dark. Base damage reduced from fire upgrade path. Bonus damage from humanity.